Looking to cut fat from your menus? There are several ways you can do just that with a few adjustments in how and what you cook. 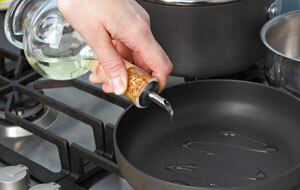 Instead of using butter or oil when cooking, use nonstick cooking spray or olive oil. Olive oil contains one of the best sources of monounsaturated fatty acids, which have been shown to improve blood cholesterol levels. And olive oil contains antioxidants that have been shown to fight numerous diseases. When choosing meat and poultry, choose extra lean meat and skinless chicken breasts. Lean beef cuts include: bottom round roast and steak, chuck shoulder, eye round roast and steak, flank steak, sirloin tip side steak, and 95% lean ground beef, just to name a few. To give you a comparison of chicken breast with the skin on versus off: One four-ounce chicken breast with skin is worth 188 calories, while a skinless chicken breast is worth 118 calories. When making a meat meal, such as meatloaf, cut some of the meat out and incorporate a healthy ingredient as a filler, such as beans, vegetables or whole grains. The next time you’re craving a hamburger choose lean ground beef, and then add in sautéed mushrooms and onions or blueberries or cherries. Instead of frying potatoes and vegetables bake them!